It is been more than 20 years since I moved to Chennai from my home town. I came here to pursue my higher studies, got a job and settled here. Initial few years, I stayed with my aunt and she took good care of me on everything, starting from educational guidance to food. I remember trying new recipes along with her on weekends to prepare some foods that I read in magazines and cookbooks. 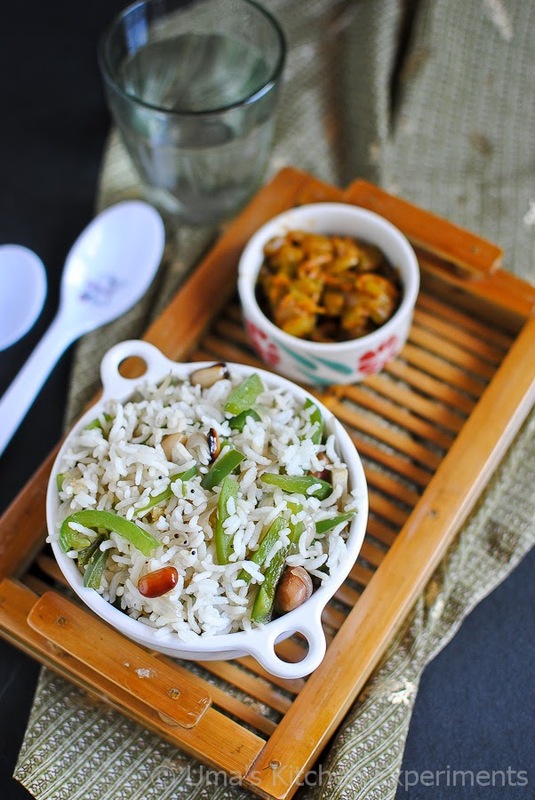 Since she works in a leading firm, she always relies on quick fix or variety or one-pot meal on weekdays. She tries detailed, long listing menu only on weekends. She introduced me to many recipes. We occasionally used to dine-out for occasions and one such occasion was at "The Residency". That was my first buffet. It took some days to develop the taste of few recipes as my taste buds are quite familiar with only traditional recipes. I also felt very happy that day, I had few dishes that I read only on books. :-) My aunt occupies a special place in my heart and she is the sole reason for what I am now. She prepares capsicum rice along with some dry gravy for my lunch quite often. I couldn't believe myself that I am the one who carefully weed out the capsicum and consume only rice. I wonder how it has become one of my favourite veggi dish now. I posted the recipe as same as my aunt used to prepare those days. You can choose colour capsicums instead of green and make your dish more colourful and make it more tastier by adding some idly podi or have it as such with some dry gravy. 1) Chop Onion and Green Capsicum. Grind greenchilli, ginger and garlic. 2) Heat oil in a pan and throw mustard seeds. Once it started spluttering, add curry leaves and asafoetida. Give a stir. 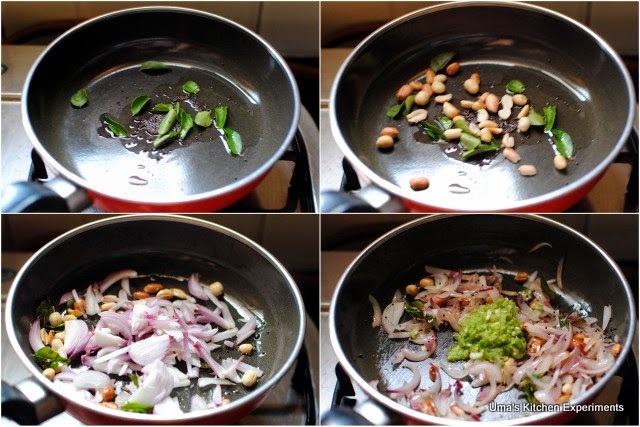 3) Add peanuts and roast it for few seconds. since we are using the roasted peanuts, it is enough to warm up slightly. 4) Add onion and sauté it till it becomes soft. Add the ground paste and cook for few minutes. The paste tend to stick to the pan. Add oil or sprinkle little water to avoid sticking to it. 5) Add capsicum and sauté again till it cooks well. Add 2 tablespoons of water and salt. Mix well for few minutes. 6) Reduce the flame to low and add cooked and cooled rice. Mix well and carefully without any trace of lumps. 7) Serve hot with any dry curry or gravy. 1) I used green capsicum here. 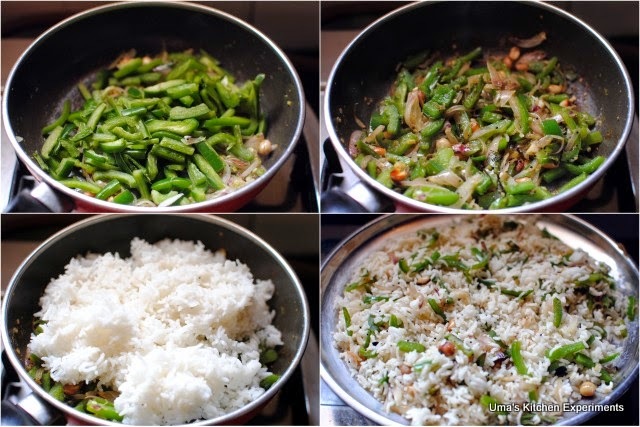 Instead of green capsicum, you can choose different coloured capsicums for colourful rice. You can also thinly slice or chop it depends on your preference. 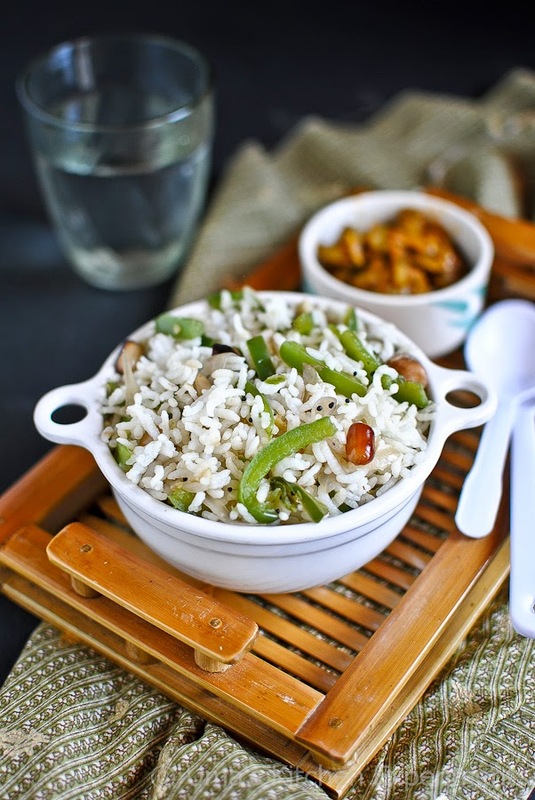 2) This rice tastes good with any dry gravy or you can have it as such by adding few tablespoons of idly powder. 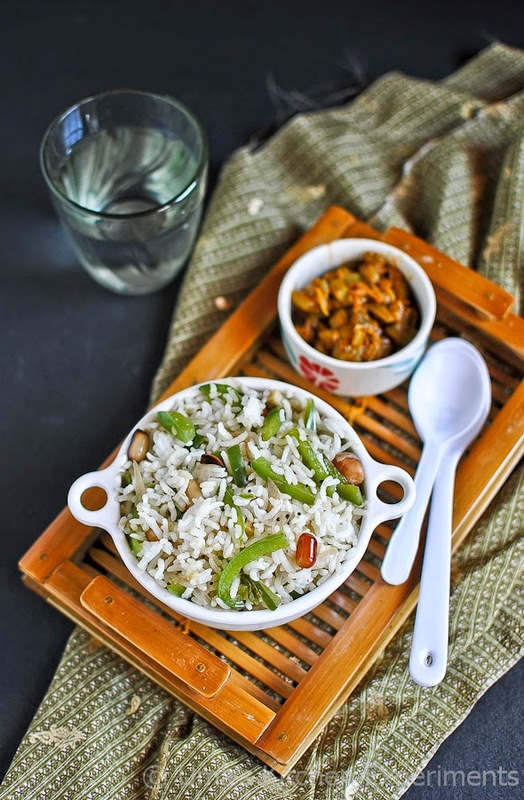 Quick and tasty rice !! 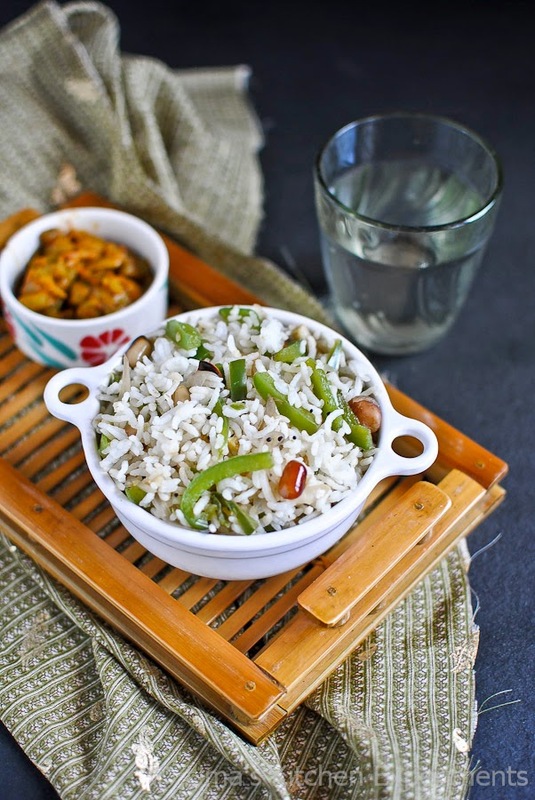 easy to make and tempting rice.